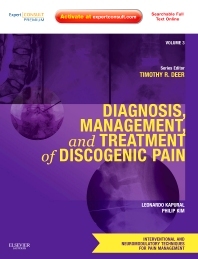 Chapter 1: Epidemiology and Etiology of Discogenic Pain: How Big is the Problem? Diagnosis, Management, and Treatment of Discogenic Pain - a volume in the new Interventional and Neuromodulatory Techniques for Pain Management series - presents state-of-the-art guidance on the full range of discogenic pain relief techniques performed today. Leonardo Kapural, MD and Philip Kim, MD offer expert advice on a variety of procedures to manage and treat discogenic pain. Comprehensive, evidence-based coverage on selecting and performing these techniques - as well as weighing relative risks and complications - helps you ensure optimum outcomes. With online access to the fully searchable text and procedural videos at www.expertconsult.com, you’ll have the detailed visual assistance you need right at your fingertips. Understand the rationale and scientific evidence behind discogenic pain relief techniques and master their execution. Optimize outcomes, reduce complications, and minimize risks by adhering to current, evidence-based practice guidelines for treating discogenic pain, when to recommend interventional procedures, how to perform them safely, and how to manage chronic back pain in the long term. Apply the newest techniques in discography, radiofrequency and heat procedures, disc fusion, nucleus replacement, and interventions for disc herniation. See how it’s done through step-by-step procedural videos on Expert Consult . Quickly find the information you need in a user-friendly format with strictly templated chapters supplemented with illustrative line drawings, images, and treatment algorithms. Access the fully searchable contents and bonus full-length videos of lumbar discography, biacuplasty, and MILD procedures at expertconsult.com.